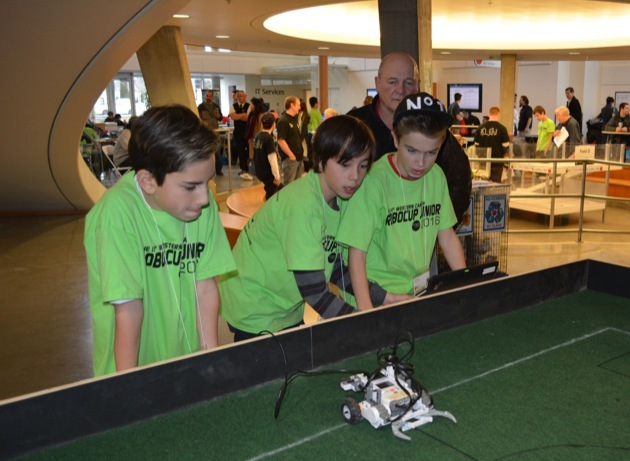 The college's Kelowna campus hosted the 11th annual RoboCup Western Canada competition Wednesday. Ask a teacher about robotics classes in local schools and he or she will tell you how they not only teach kids about technology, science, team-work, problem-solving and self-starting, they also provide hands-on learning that can means so much more than theoretical learning alone. But ask one of the kids who competed at this year’s 11th annual RoboCup Western Canada event on Wednesday at Okanagan College, and he or she will tell you it’s just fun. There was a lot of fun being had at the college Wednesday as 140 kids aged 19 and younger, on 52 teams, participated in a number of RoboCup events, pitting their technological creations against one another. The event saw small robots, built and programmed by the students themselves, compete in soccer, search and rescue and dance. “The aim for us is really to instill a love for science and technology in the students,” said Nadir Ouldkhessal, organizer of the event and the chairman of the electronic engineering department at the college. He is also a national representative for RoboCup Junior Canada. He said in 2006, the event started at the college with just nine teams and now attracts students from across B.C. and Western Canada, as well as Ontario. This year, a team from Aurora, Ontario was their practice its skills for the Eastern Canada event to be held later. The winners of both the Western and Eastern competitions have the opportunity to represent Canada an international event, to be held this year in Nagoya, Japan. The robots, more like little boxy machines on wheels than your typical human-form robot with arms and legs, were built and programmed by the students themselves and once on the field of play at the RoboCup event, were on their own. Using sensors, and in the case of soccer, a special ball emitting an infrared light, the machines played on a small pitch against each other trying to score into goals painted different colours so they could be to be recognized and differentiated by the robots. In the search and rescue competition, the robots had to traverse a two-level space representing a three-room collapsed structure, climb over debris and rescue a person represented by a small can. The dance competition pitted programmed robots dancing to pre-selected music. For Sophia Clancy, a Grade 6 Rose Valley Elementary student, who along with her teammates Taytym Roffey and Livia Utigard, created a robot with black shaggy woolen hair named Jimmy, for the dance competition, engineering has been something she’s been interested in for a while after helping a friend’s dad who is an engineer at his workplace. Her two teammates said they both would like to study technology, particularly robotics, and one day teach it. Over at the soccer fields, three of their Male classmates, Lukas Costa, Donovan Thomas and Kai Hatley-Wayland were trying some last-minute tweaks to compensate for a sub-par performance by the sensor in their robot. “It’s a little too high off the ground,” said Lukas, as the three scurried away to try and adjust the programming. Jim Bradshaw, their teacher said as word spreads about the robotics program, more and more students want to get involved. And it’s like that at other schools in the district too. That popularity is replicated across SD23, said retired computer science teacher Murray Chalmers, who now works for the district under contract and helps students with the programming of their robots, said the SD23 has its own version of the RoboCup, the SumoCup, where robotic sumo wrestlers, build and programmed by students, fight each other. Results of the RoboCup event were to be posted on the Okanagan College website Wednesday afternoon following the competition.